Previously on Things of No Interest - at the start of March, I set a goal of putting together a model and submitting it to a painting contest at the AZ Gamefair gaming convention. 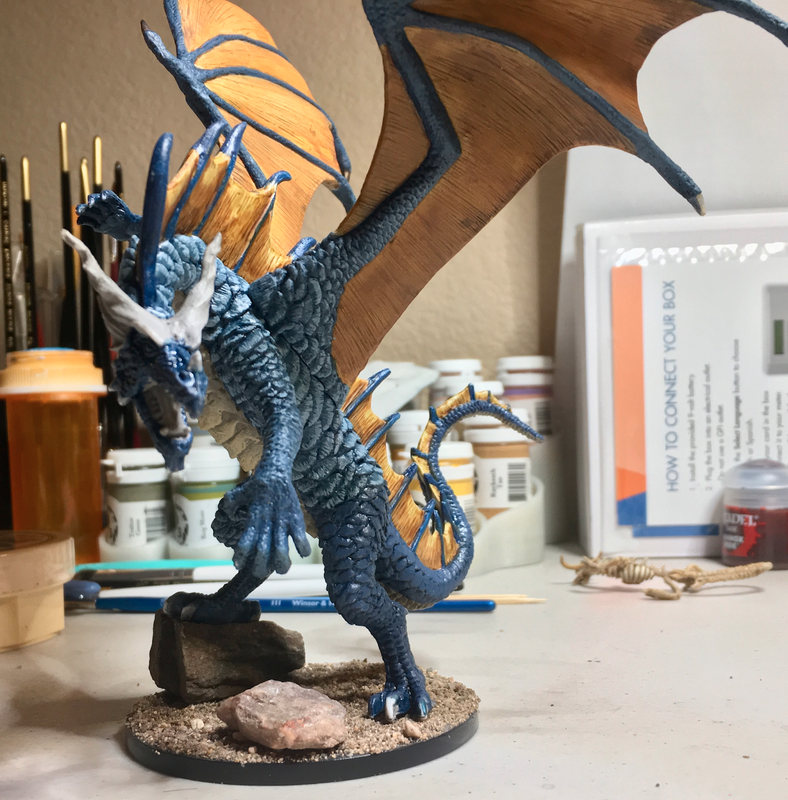 I chose a "large model" (Reaper's Cinder dragon) and here's the rest of the story I started last month. This is Parts III and IV, along with a couple of bonus pictures. Well, as usual, things don't go as planned. My love got a nasty head cold and was laid up for a couple of days and then of course I got it and was out for a couple days and work and stuff... So yesterday I realized that, Holy Crap! 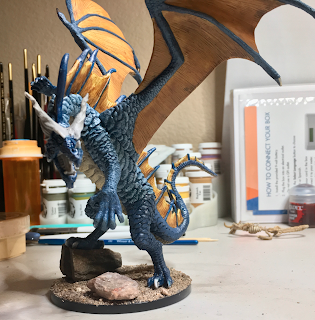 I have like a week to finish this stupid dragon I said I was going to try and enter in the painting competition at the AZ Game Fair. I had barely done anything since the last time - ugh. So last night I set about to try and get caught up a little. Since last time, I worked on some of the fins on the spine - I wanted to get the area from the head down to at least past the wings so that I wasn't having to try and work around the wings after I attached them. I didn't do the whole shebang since I wasn't quite sure that what I had in mind was going to look the way I wanted it to (and in a lot of cases, I can't quite tell when I'm doing it and things are wet, since I mostly was using washes for this). Like the wings, I first used Secret Weapon Wash Golden Brown on the fins. This really comes out looking yellowish with flecks of sparkles. Next I used Citadel's Sepia wash, leaving a small area near the top portion of each fin alone. Finally I hit the inside edges with a small amount of Citadel's Agrax Earthshade to darken that area. The result was about what I wanted - still lighter than the wings, but similar in colors. I still need to go back and touch up the blue spines a bit and also finish the fins, but that shouldn't be too bad. I attached the right wing and then had to spend some time filling in the resulting gap with some green stuff and texturing it and painting it to match the scales on the wing and body. I also "finished" the right wing (meaning I got around to doing the claws on the wing tips). I then varnished the scales and wing on the right side so I wouldn't rub or chip the paint as I was working through the rest of the model. The left wing did not have the gap issues the right had, so I haven't applied any green stuff. The wing has a small "line" along where the wing sits against the body, but I can't see where adding green stuff will hide that - the scales just match up funny along that segment. I was expecting that area to need green stuff, so I hadn't done the last row of scales (as seen in the picture). That detail and the claws on the left wings need to be done and then I can call the wings completed. And now - the last week of work before the contest at the AZ Game Fair! Doing the scales on the leg and tail felt like more work than the area from head to hip. I think in the end, my hand started cramping a little. Minus the foot and the claws (everywhere), the right side is more or less complete. I wanted to share the inspiration for the look of the scales - an inspiration from my childhood. In the 1981 movie Dragonslayer, the hero collects the dragon's shed scales to use as a shield. When the old wizard examines them, he notes the age of the dragon and how the scales were worn. The above picture is some of the actual props from the film. You can see (the scales are upside down in the picture) that the end is frayed and worn, which is what I want the scales to look like on this dragon. She's blue, but the grey-blue edges are the frayed edges. I normally dislike getting up close to my models after they've been painted, because I think it looks like crap, but on this model, as you get a little closer, you start to recognize the texture that is there. If you just stand back and look at it, you probably aren't quite getting the full effect. As I worked on the leg I realized that I hate the feet on this model. They are quite blocky - I assume because the model needs them to be thicker to keep the sucker standing, but they look dumb. I'm starting to think I might have to go with a snowy base for the dragon to stand on so I can cover the feet a bit. There doesn't seem to be a great way to paint them to look better. Work over the weekend didn't progress as far along as I hoped, though things went decently enough. I picked up a bottle of super glue at the Dollar Store (for a buck) and grabbed some sand from the playground next door and started working on the base for the dragon as I was getting tired of worrying about the model leaning on things and rubbing paint off. I wanted to get the dragon on the base! I also grabbed a couple different rocks from the yard because the feet aren't even and I wanted one foot up on something. I found the perfect rock and after fiddling around with the glue and sand, finally got everything in place. LESSON LEARNED - wait for the glue to dry fully. I got a bit impatient after gluing everything and was trying to figure out what I should do about the feet, and the dragon decided to move on me. I got everything back in place, but decided I need to just walk away for a bit to let everything dry. I also decided I needed something more on the base. At the very least, a skull or a sword. 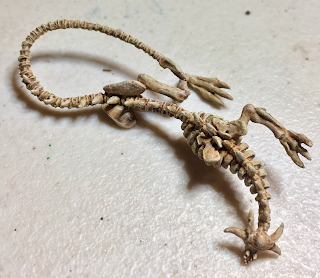 I went to go hunt in my bin of minis and found a baby dragon skeleton that was perfect for this. It only took about 15 min to prime and paint up the skeleton (it actually had a bunch of other parts, but I like that this skeleton isn't complete). It sits perfectly between the bigger rocks and legs. Is the dragon still defending its long dead baby or mad that someone killed a dragon? Regardless, it makes for a good story. The real question is what to do about the feet - I had planned to use some snow effects to cover the feet a bit, but now, I'm not so sure. I played with a couple of different snow effects (spray and brush on) and didn't like any, so decided to forego them. With that decided, I went ahead and finished off the claws everywhere except for one wing. I'm debating whether I like the dark version or whether I want to make them consistent with the other claws on the figure. I put off that decision and started working on the face. I didn't want a straight blue and I think I ended up with an effect I liked. Just a hint of blue on the tips of the horns and muzzle (maybe a hair more than a hint on the bridge of the nose. The mouth was pretty much just pink, pink and red washes, a little red paint to darken the tongue a bit and then the teeth in an off white. I had been worried about the horns (and face in general) but I think it turned out decently. At any rate, here is the more or less (say 95% done) figure. A couple more touch ups and she'll be ready for submission. I even named her - Nosyla (after my love Alyson). When I started this, the goal was pretty much to just do something I hadn't done before - put together a model that would be worthy of entry in a competition. Most of the work I do on Descent is tabletop quality. Not necessarily slapped together, but I don't sweat all the tiny details either. This is one of the largest models I've ever done and I spent a lot of time working through details and trying things out off the model to figure out what I wanted (and was capable of doing) on the model. I didn't get anything else painted this month (I primed and base-colored a handful of figures, but really, this took all my time and attention). I won't say I won't try something like this again, but I don't feel like I need to do this all the time. RESULTS! 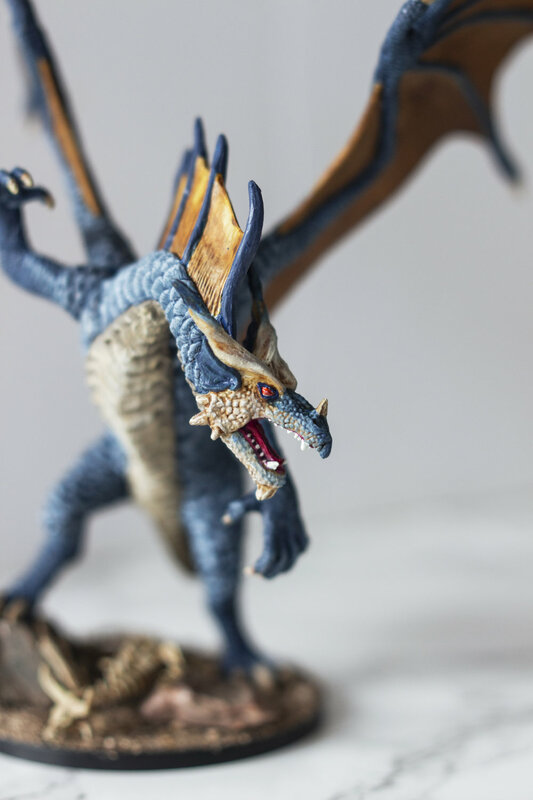 The dragon won for the amateur large model category. I got some great feedback from the judges (I was in the running for the amateur Best of Show, and learned about the small things that might have pushed me into that win). It was a lot of work, but I'm super happy with the results (both visually and how I did in the contest). Excited to see where I go from here.